Kasauli is a solitary settlement on a hilltop, in Solan district of Himachal Pradesh. It is located about 320 kilometers away from New Delhi. The landscape, climate and the terrain of Kasauli are completely different from other hill stations in North India. And, being located is one of the young Himalayan Mountains; Kasauli is very rich in flora and fauna. The name Kasauli is derived from a flower called Kasool, which grows in this region. The town is most commonly known for its lush foliage, quietness and its cobbled passages. The extremely neat town is situated 6100 ft above the sea level. The region is suitable for vegetation such as Himalayan Oak, Chir-Pine and Horse Chestnut trees to grow in abundance. The town also exhibits an exceptional concoction of British Victorian age, the Indian Medieval Period and the Modern Indian. Every year, this small town receives a huge number of tourists, especially weekend travelers from the neighbouring cities. In the 17th century, Kasauli was home for the Rajput families, but it was taken over by the Britishers in the 19th century. Thus, besides Shimla, Kasauli became a summer destination for the British generals and the soldiers. Today, Kasauli is not only a tourist destination, but it is a large military cantonment. This town is slightly on the upper-range (Expensive), thus most backpackers usually avoid going to Kasauli – room for one night starts from Rs.1000. In Kasauli, resorts outnumber hotels and guesthouses; resorts at the upper mall road provide the best view in the whole town. 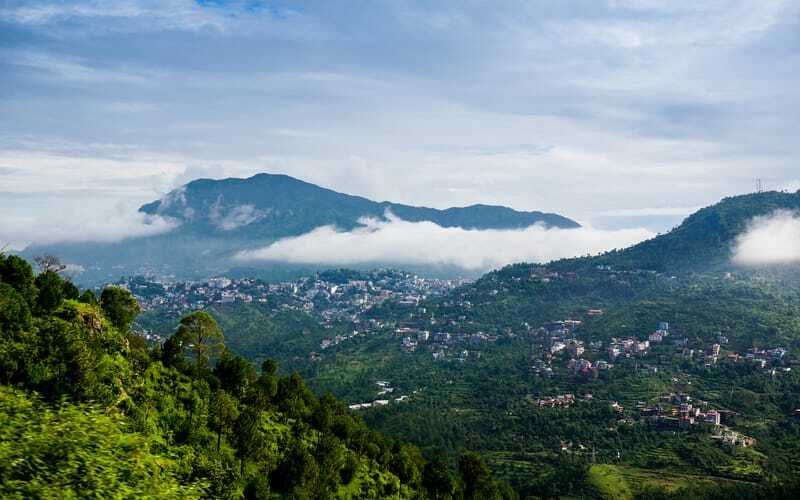 Vacationers love walking on foot to explore the town, but the picturesque Kasauli surroundings can also be explored on rented motorbikes and taxies. What can you do in Kasauli? Very simple! Take a few good books with you and drink a lot of Tea! But if you have plans to explore the town, make sure to carry an umbrella or a rain jacket; the weather in Kasauli can be very unpredictable. The first and foremost destination is the sunset point. This spot is located approximately 1.2 km away from the Kasauli club House (The Upper Mall Road) or 2.5 km from the bus stand. Walking on this particular stretch is very pleasant! In a way, sunset point and monkey point offers the same view, except that, for security reasons tourists are not allowed to visit the monkey point after 5:30 P.M. The sunset view is simply wonderful; the entire scene looks like an artwork on a huge wall. Cuddle up, take pictures; snug-in, the choice is yours, but make sure you visit this place. The best time to visit sunset point is between 6:30 P.M and 7:30 P.M. (depending on the season). After the sun sets in, for a change, the sky and the earth resembles each other. They look equally beautiful; the sky is full of stars, scattered everywhere and the same on earth as people living in the low-lying area turn on the light. Note; they do not allow visitors to go beyond the Air Force check point (Which is 1 km before the sunset point) after 7:30 P.M., so make sure you are already inside! It’s also the highest elevation point in Kasauli, where a temple is erected in honor of Lord Hanuman (the Hindu Monkey King according to Hindu mythology). It’s a pleasant walk to the monkey point, which is around 5 km from the main town. Once inside the premises, one has to climb around 0’8 km to reach the temple. Otherwise there is a restaurant inside the premises with severs excellent tea and after a good view of the Punjab plains. All sorts of electronic devices, including phones, cameras, pen drives, music player etc are strictly not allowed inside the premises. Make sure you don’t carry them with you, unless you travel by car where you can deposit them safely – also carry your passport or an identity Card with you. On a clear day, one can see the plains of Chandigarh, the terrain of Punjab, the hills around Shimla and the silver lining of Satluj River. There are few sunrise points in Kasauli, the most prominent being one on the way to monkey point and the other on the way to sunset point. For early birds, this is the perfect destination. Most travelers say; a Trip to Kasauli is incomplete if you fail to witness the sun rise – the crimson sun slowly emerges, the world becomes brighter and brighter, it looks like the sun will never stop growing in size. Kasauli has two markets adjoining to each other, Pine Mall and Heritage Mall – stretches around 150 meters. They are very small markets, but sell cute and fancy items such as handicraft, accessories and women clothes. Also, there are small eating joints, which sell Maggie, Thukpa, Momo etc. but if you want something different, visit Rudar Café – the café was opened by few boys, a year ago. They play nice music throughout the day, and the food is great too! The Christ Church is nothing fancy, but quite attractive! It was built in 1844 and located right next to Kasauli bus stand. It was built in the style of Anglican churches – the lustful shrubbery and trees around add to the beauty of the church. On a regular day, this church is flooded by tourist taking pictures and walking around it. Strolling through the narrow thoroughfares and bird watching are very common activities among holiday makers. Above all, the best thing to do in Kasauli is to simply stroll or pick a conversation with some stranger over a cup of tea. Remember they are also travelers like us and are looking to engage in some adventurous activities! One cannot get loud on the street; it’s a cantonment area. Smoking is strictly prohibited in public places; penalty can go upto Rs.25000. besides, it’s best to make hotel reservation before arriving at Kasauli.